CHICAGO--(BUSINESS WIRE)-- Hyatt Hotels Corporation (NYSE: H), PRISA Group and McConnell Valdés Consulting, Inc. announce the opening of Puerto Rico’s fourth Hyatt-branded select service hotel, the $29 million Hyatt Place San Juan/City Center in the capital city of San Juan. Hyatt Place San Juan/City Center is ideally situated in the metropolitan area, just steps from the Puerto Rico Convention Center and minutes away from the international airport and all major attractions. The 149-room Hyatt Place San Juan/City Center was developed as a joint venture between affiliates of Hyatt, PRISA Group and McConnell Valdés Consulting, Inc. 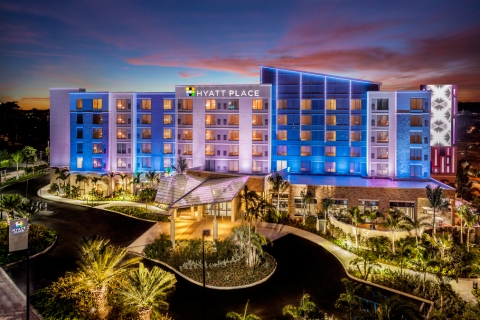 The hotel debuts after the opening of three Hyatt branded properties in Puerto Rico in the last two years: Hyatt Place San Juan/Bayamón, Hyatt Place Manatí and Hyatt House San Juan. This hotel opening reflects Hyatt’s and the PRISA Group’s commitment to Puerto Rico and the Caribbean region. The hotel features the Hyatt Place brand’s intuitive design, casual atmosphere and practical amenities, such as free Wi-Fi and 24-hour food offerings. Hyatt Place San Juan/City Center is located near all major attractions including historic Old San Juan, beaches, the marina, cruise ship terminals, entertainment and sports venues, the Hato Rey business district, museums and cultural centers, as well as the chic Condado and Miramar neighborhoods, home to a wealth of dining and shopping alternatives. Additionally, Hyatt Place San Juan/City Center offers unique elements and amenities, such as a resort-style swimming pool and water feature for children and as well as a digital artwork display on the building’s exterior by local artist Annette Vaccaro. The unique and innovative digital art installation along the hotel’s façade is the fourth collaboration of its kind between PRISA Group and local artist Annette Vaccaro. Outdoor swimming pool area, with over 11,000 square feet of resort-style pool space and water features that includes a children’s play area with slides, sprinklers and other fun activities, as well as an adult lounge area with hot tubs; and a convenient poolside bar offering light fare and drinks. Hyatt Place San Juan/City Center is under the leadership of General Manager Gisela Rivera. In her role, Rivera is directly responsible for managing the day-to-day operations of the hotel, including overseeing the hotel’s 60 associates and ensuring guests encounter the thoughtful service for which the Hyatt Place brand is known. Additionally, Mariani will oversee the four Hyatt-branded hotels in Puerto Rico, including Hyatt Place San Juan/City Center, Hyatt Place San Juan/Bayamón, Hyatt Place Manatí, and Hyatt House San Juan. Mariani is supported by Area Director of Sales Laura Soto-Reyes. Hyatt Place, a brand of Hyatt Hotels Corporation, offers more than 235 locations in the United States, Armenia, Chile, China, Costa Rica, Honduras, India, Mexico, Morocco, Nicaragua, Panama, Puerto Rico, The Netherlands, and United Arab Emirates. For Hyatt Place information or to make a reservation, call 1-888-HYATT-HP (888-492-8847) or visit hyattplace.com. PRISA Group (PRISA) is a family-owned developer, builder and owner of green residential communities, hospitality and resort projects in Puerto Rico and Florida with over 6,000 units in planning and construction, representing a value of over $3 billion. The firm has delivered over 3,000 units in the last 20 years and owns and is currently developing projects in San Juan, Dorado, Bayamon, Manati, Vega Alta, and San Lorenzo, Puerto Rico, as well as in Orlando and Tampa, Florida. PRISA is currently developer and co-owner of the Dorado Beach Resort, a 1,400-acre $1.4 billion development, anchored by the $340 million Dorado Beach, A Ritz Carlton Reserve, which opened to the public in December 2012 to great acclaim, and the $228 million J.W. Marriott Dorado Beach, currently in development and expected to break ground 2Q 2016. In addition, the firm developed and owns two Hyatt Place & Casino projects in Bayamon and Manati, Puerto Rico, which opened in December 2013 and March 2014, respectively, and the Hyatt House San Juan, Puerto Rico’s first extended stay hotel, which opened in October 2014. PRISA has received numerous awards, including Builder Member of the Decade and three Master Planned Community of the Year Awards by the National Association of Home Builders’ Puerto Rico Chapter, the highest honor bestowed upon Puerto Rico developer, the Frank Ramirez de Arellano Award, and the ULI Southeast Florida/Caribbean 2013 Vision Awards’ Project of the Year for Dorado Beach. In November 2014, the firm was awarded the Developer of Year award by Hyatt Hotels Corporation for the development of its Hyatt portfolio. The firm’s next projects include District Live!, an urban entertainment complex in San Juan, Dorado Beach Health Center in Dorado, Puerto Rico, a 120-bed acute care hospital in affiliation with a renowned mainland hospital brand, and a portfolio of Hyatt and Marriott limited service hotels in the Southeastern U.S.
About McConnell Valdes Consulting, Inc.
McConnell Valdes Consulting, Inc. (McVC) is a Puerto Rico corporation specializing in the planning, financing, development and marketing of hospitality and mixed-use real estate projects in Puerto Rico. McVC personnel have over 30 years of experience in the hospitality and real estate industries and have advised local and international clients in designing and executing complex hospitality and real estate projects in Puerto Rico, the Caribbean and Spain. McVC is an affiliate of McConnell Valdés LLC. This affiliation provides the continuity and support of one of the nation’s most respected Hispanic-owned law firms combined with the hospitality and real estate expertise and transactional track record of the professionals at McVC.